One of the fastest growing trends in Florida divorce cases is the use of divorce mediation to settle outstanding issues between spouses. As an alternative dispute resolution technique, divorce mediation has the potential to make your divorce faster, less stressful, and cheaper than traditional divorce litigation in a Florida family court. Steve W. Marsee has years of experience helping clients navigate divorce mediation throughout the Orlando area and can expedite your divorce through the same means. Call or contact his office today to learn more. Mediation is an alternative dispute resolution technique that utilizes a neutral third party, known as a mediator, to talk through problems and collaborate on unresolved issues in your divorce. Divorce mediation can help resolve all types of outstanding matters in your divorce case, including issues of property distribution, spousal support, child custody, visitation, and child support, among others. Typically, each spouse comes to the mediation with their own attorney, and the mediator is usually a former family law attorney or judge. The mediator will speak with each spouse individually to discuss their unresolved matters and desired outcomes before mediating terms between spouses. If both sides can come to a resolution on their issues, the mediator can help the attorneys draft a final divorce agreement. If not, the process begins again in a Florida family court. There are many benefits to using divorce mediation to try and resolve your differences with your spouse. 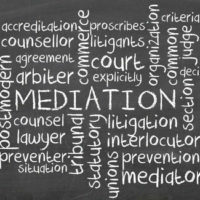 First, mediation is usually cheaper and faster than typical divorce litigation. Handling all divorce issues in court can be a lengthy process, often taking months or years depending on the complexity of the marital estate and outstanding issues. This in turn creates more legal fees, which can make a divorce fairly expensive. Mediation occurs on a schedule that works for both spouses, and if the couple comes with an open mind to finding solutions the process can often be finished within one or two sessions of meeting. Another benefit to mediation is the reduced stress and emotional toll of a traditional divorce on your and your family. Mediation utilizes a collaborative approach as opposed to an adversarial approach in court. By coming together to find solutions that work for everyone, the psychological stress of a divorce can be greatly reduced. This is a particularly helpful process when there are minor children involved because the parents will continue to see each other and interact regularly about their child’s needs. One final benefit of mediation is the confidentiality. If you choose to try mediation and the discussion falls apart, nothing said or agreed upon during the mediation can be used against either spouse in family court. In addition, the mediator cannot be called as a witness by either spouse to attest to what was discussed or agreed upon before the mediation fell apart. To learn more about divorce mediation in Florida and whether it may be the right option for you, call or contact the Orlando divorce lawyer at the law office of Steve W. Marsee today to schedule a free consultation of your case.